Over the weekend we finally saw the end of Muammar Gaddafi, found in a sewer wearing gold pants and missing his characteristic toupee, relayed through live tweets by media that replayed every video of the Libyans captured on their mobile phones. Gaddafi, bloodied and tied to the front of the car was shown dragged and beaten, then raped with a stick, then placed unceremoniously in a meat freezer with his son Mutassim as jubilant Libyans took morbid photos beside his corpse. Gaddafi's death has both delighted and horrified the international community and exacerbated the divides in ideologies and theories that circulate around international interventions. The Libyan situation is difficult to read at the moment, which is largely a result of it being currently a nation in flux and the pervasiveness of rumor, which we have seen in the rumors of the F16 jets before NATO arrived, Gaddafi mercenaries from Chad that resulted in the impromptu genocide of many of Libya's migrant workers, the use of Viagra by soldiers, and also the propaganda from Gaddafi's Green Brigade of being some kind of socialist oasis of women's rights in the Arab world where everyone receives free electricity. Libya is rife with rumor at the moment, and we will need to wait for the dust to settle for some of these to be verified. 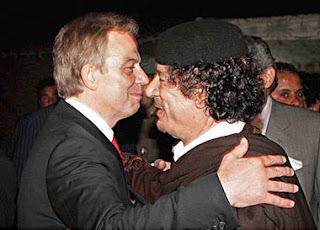 However, we do know that life in Libya under Gaddafi was not as open as it seemed under a leader who rose to power through force, engaged in the extra-judicial killings of his political opponents throughout the 1970s and 80s and tortured those who promoted dissent. The extent of the misinformation is summarized here in a wonderful and humorous account by a Libyan forced to translate for Gaddafi's regime. Gaddafi's brutal end is the opening of a Pandoro's box for the west, but not in the sense that many predict. The National Transitional Council has claimed that they were unable to control the rebel fighters. This does seem viable given the way that the conflict arose. Gaddafi sent the military in on his protesting citizens, who took up arms in force forming a rag-tag bunch of rebels, with some reports that there was a Kalikshnikov per 14 men. While many have pointed the finger at the US, Italy and the UK for their role in the NATO intervention, the British SAS were training pro-Gaddafi troops in 2009 before switching in approach. Gaddafi's previous role as a darling of the west is evident in the snap happy photographs of former times, where he is pictured with world leaders, perhaps most evident in his son Saif's deep relationship with sociologists like Anthony Giddens at the London School of Economics and his proposed 'third way' for international politics (Libya, apparently, was the 'Norway of Africa'). Saif was also awarded his PhD here, and was guarded by MI6 while in London. Despite the conspiracy theories emerging now, as Juan Cole highlights, it was far more in the west's national interests to keep Libya as it was - a nation for which there was no problem in trading arms and securing lucrative oil agreements with companies such as BP. US Defence Secretary Robert Gates' well publicized protestations that it was not in the US' national interests to intervene in Libya should be a cue here that this was not the preferred option. The resistance moved quickly from being referred to as 'rebels' in the western media to 'activists' as the interpretation of the west swung. The confusion over the west's role in Gaddafi's regime and the circulation of discourses on the rebels is well documented here by Andrew Gavin Marshall in an article well worth reading if you have the time. The problem with the NATO intervention is perhaps less the movements within the country, and more in its interpretation by blocs of alliances. We do not know yet what the National Transitional Council will do, what kind of Sharia law they will introduce, and what kind of implications this will have for some of the most important issues facing the country: the division in allegiances and protection of pro-Gaddafi forces from retaliatory violence; whether they will lean towards the Arab world, the west, or the African Union (Gaddafi was successful in courting the latter two); what implication this will have for women's rights (which despite Gaddafi's prediction that every woman would become a "killing machine" for preserving Green Libya, simply did not materialize). Women did have many restrictions on them in Gaddafi's society, and they did play a very active role in the revolution with many women's civil rights groups emerging, but their role will be affected not only by the NTC's decisions, but also from pan-Arab discourses that played a vital role in kick-starting the rebellion and saw women contesting the interpretation of the west that they had no role in civic political life. There is a lot of debate over the role of international interventionism and it is complex. Where the west has not intervened in genocide they have faced fierce criticism, and sometimes intervention has led to more stable societies (as in the example of the Bosnian War). There is even more debate over the legality of such actions - no fly zones, for example, are a violation of national sovereignty and aggravate tensions over the western led extrajudicial killings of figures like bin Laden, the lack of consistency in their application (the US and UK have turned a blind eye to the Saudi led brutal oppression of the uprisings in Bahrain, which is not considered in the national interests for achieving democracy), the vestiges of colonialism and the inconsistent application of war crime trials, which since WWII's Nuremburg Trails, have tended to favor the victor and the economically powerful. The NATO intervention has upset both the Arabs and the Africans, who represent two of the most important negotiating blocs due to Gaddafi's unique ability to appeal to all sides - darling of the African Union for promoting pan-Africanism, favored by Arab nations for his condemnation of Palestine and creation of an Islamic League in the early 1970s (although to be fair, many were suspicious of his behavior and perplexed by his near complete lack of decorum, entourage of women bodyguards and Swedish nurse), and friend of the west for his oil. The foundations of the Libyan uprising seem to have flown across the borders through the influence of the uprisings in Tunisia and Egypt, which have now seen protests or uprisings in 17 nations and are currently threatening Syria's Assad. Others, such as the protests that saw 1/4 of Bahrain protesting, have seen brutal oppression, with doctors and nurses being tortured for treating patients, the introduction of Pakistani troops by the Saudis who feared the uprisings reaching the Gulf, and the painting of this conflict as sectarian violence between Sunni and Shia muslims by the western media. While the protests across the Middle East and North Africa were initially treated with suspicion by the western media, who looked back to the Iranian Revolution for an example of things swinging backwards for citizens, they eventually challenged the long held myth in western culture that Arabs like being dominated by dictators (as US right wing commentator Ann Coulter, who is immune to both the winds of change and reason, concluded "my dog knows more about Arabs than Obama"). There is evidence to suggest that many were acutely aware of western bias in the media, from Egypt's incorporation of the V for Vendetta Anonymous symbols and production of music videos, to the efforts of Moroccans and Libyans to subtitle videos in English, to the enormous popularity of the remix of T-Pain's 'Zenga Zenga' by Israelis of Gaddafi's speech where he referred to his challengers as 'cockroaches'. It appears that the Obama administration is taking note, with Obama stuck in a difficult position with Republicans accusing him of 'leading from behind' and the release of statements that say 'iron-fisted regimes' should be worried. Such lip service, and it is lip service in regards to foreign policy, is a much smarter approach than Netanyahu's, who despite being surrounded by nations entering flux seems keen to stick with his own interpretation in spite of the response from many Arab nations that he should talk to the hand cos' the face ain't listening. However, the role of NATO will be of much debate as it highlights the complicity of western countries in generating instability to their own ends - the recent intrusion of US troops into Uganda, for example, draws attention to the hypocrisy practiced in foreign politics for African nations. For Arab nations, the involvement of US troops in 97 nations in what is increasingly referred to as 'Obama's arc of instability' is not hidden by the veneer of mainstream media as it is in the west. And while those in the west increasingly condemn the Libyan rebels as barbaric for their treatment of Gaddafi in death, across the borders it just serves to highlight western indifference from the violence that we are involved in. While as Foucault traces in his 1977 work Discipline and Punish, the west has been involved in a process of hiding torture and prisoners, for many of those outside, violence is an every day reality. As borders become more transparent through the rise of social networking technology, and many journalists now seek sources through mediums such as Twitter, state representatives are increasingly surpassed in compiling narratives. We may now be entering the era where these hypocrisies are much more transparent. Gaddafi may have been successful at getting support by African leaders, (although it must be noted they never followed through on his dream for a united Africa along the lines of the EU), but he failed miserably in terms of his Arab nationalism. The fact that the Arab league basically green lighted the NATO action against him highlights how disliked he was amongst the wider Arab world, at least amongst the elites.